As a new parent, you have probably had the lovely daydream of looking down at your tiny bundle of joy in cute pajamas sleeping peacefully in a crib with a smile tugging on your baby’s lips. You might even have gone as far as getting the cutest crib in anticipation. But the sad truth is getting your baby to sleep in the crib might be harder than you have ever imagined. You start out with your baby sleeping in the bassinet for the first few months due to the need for constant care and feeding schedules. It just seemed more practical to keep the baby as close to your bedside as possible in the event of a potential food emergency. But the time will come to transition your baby to crib either on doctor’s orders or because your baby has simply outgrown the bassinet. This could signal a big change in your baby’s sleep routine. If you are wondering what the process would be like to transition your baby to the crib, here are a few factors to consider. How do you know when your baby is ready to transition to the crib? You need to determine if the time is right for the transition. Baby’s grow at an incredible exponential rate during the first few months with growth spurts. If your baby has grown out of the bassinet, it might just be time to transition your baby to crib. You don’t want your baby bumping into the sides of the bassinet and waking up crying. Most baby’s transition into the crib between 3 months to 6 months. If your baby is still sleeping peacefully in the bassinet, it might not be time to rush into transitioning the baby to a crib. But the longer you wait can determine the resistance encountered with your baby. A younger baby would be easier to transition to crib that an older baby that has gotten comfortable in that bassinet. Also, try not to transition before making a major change in the baby’s environment such as a vacation or moving into a new house. The hardest part about transitioning your baby to crib has to be actually ‘transitioning the baby’. It might seem a little confusing at first and you might have numerous question revolving around the process. How do I put my baby to sleep in the crib? What can I do to make my baby more comfortable? A full-size crib to accommodate growth spurts along the months. This allows the crib to be versatile and spacious. A firm mattress to help the baby sleep better and prevent aches. Your baby might not have the strength to push away from a soft mattress cutting off the air supply. The firm mattress would prevent the baby from moving into a dangerous position during the night. A clear sleeping space with no pillows or blankets getting in the way of your baby’s sleep. This is also to ensure your baby stays safe regardless of the tossing and turning. Putting your baby down on their back to sleep. This is the safest sleep position. This decreases the chances of Sudden Infant Death Syndrome (SIDS) and your baby gets to sleep comfortably. Optimal sleeping environment between 68 to 72 degrees F. for your baby. Getting your baby to sleep at the right temperature with no doubts increases the quality of your baby’s sleep. Once you have gotten all the necessary elements for the transition process available, the big question is what is the best way to make the transition with as little resistance as possible from your baby? A great way to get your baby to start sleeping in the crib is to ensure the crib feels extra comfortable. Make sure the crib sheet is not to cool when placing the baby in the crib as this could wake the baby up. A sleep sack is a great way to transition your baby from swaddling and ensure your baby feels warm in the crib. If your baby loves to be near you before falling asleep, your baby will likely crave your smell when asleep. Try sleeping on the crib sheets before transitioning so that the sheets smell like you and you can create the illusion of being near. Your baby needs to feel safe in the crib and this feeling cannot be developed overnight. Your baby has to feel comfortable in the crib space before transitioning fully. You can move the crib into your room first and get your baby to sleep in it before moving the crib back to your baby’s room. You can also try getting your baby to take naps in the crib during the day before trying out transitioning at bedtime. Another helpful tip would be to stay in the room for some time during the initial stage of transitioning until your baby falls asleep and slowly shorten the time until your baby doesn’t need you there to fall asleep anymore. Babies usually have a predictable sleep cycle and thrive better when they have a sleep routine. Being consistent is great for your baby. They find comfort in predictability and knowing what comes next during the first year. Observe your baby’s sleep pattern and create a routine around it. Find out what works best for your baby and ensure you stick to this sleep routine to make the transitioning process as easy as possible especially for younger babies. Get ready for the initial whimper when you drop your baby to sleep alone in the crib. The transition process can be difficult even when necessary. The baby might take a little while to get familiar with the new sleeping environment. Observe objectively and try not to go into the room everytime you hear the baby make a sound. You can always check on the baby with the baby monitor to be sure everything is okay and the baby is just fussy. The goal is to get your baby to learn to fall asleep alone without any help. Babies can only fuss for so long except there is a medical reason. 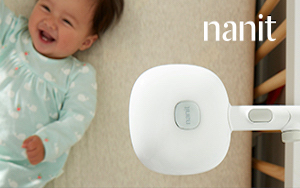 The Nanit baby monitor helps you keep tabs on your baby in the transition process. You can track the baby’s sleep pattern and changes in temperature and humidity. It tracks your baby’s progress and improvements in falling asleep alone to encourage parents. Using white noise from a sound machine to transition your baby might be great in preventing your baby from waking up at every sound in the house. If your baby is already used to a particular white noise, try using this sound to get them to sleep better in the crib and ease the transition. The white noise would help drown out any distracting noise and ensure the baby gets a good night’s rest. An important question in the process is how long should it take in transitioning a baby to crib? How long is too long? How short can the time be? There is no fixed time for the transition process and it could range from a few days to a few weeks depending on how gradual the process is. It could also depend on the baby’s readiness or resistance in moving to nighttime sleep in the crib. Parenting comes with a lot of ups and downs no matter how prepared you might be for that situation. Transitioning your baby to the crib might seem like a nightmare initially with all the cries and fuss, but every day will get better. It is all about time and the approach method so remember to cherish each moment and create lasting memories for you and your baby.